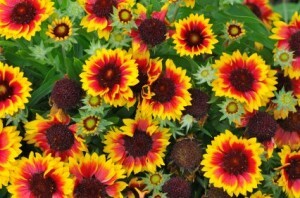 Blanket Flower (Gaillardia) is a summer flower that has about 30 different species. They can be perennials, annuals, or even biennials. They resemble the daisy and come in a small variety of bright colors. Gaillardia grows in shades of yellow, red, orange, and mahogany. They either grow in one color, or two. Some have a yellow outer edge with an orange burst in the center. The leaves on the flowers are a bright green shade, and have toothed or fringed edges. If you live in a super hot region, then this flower is perfect for your garden. It is very tolerant of hot temperatures. It actually thrives during bursts of summer sun and heat. This plant may get its name because of the way it grows. They grow to be about 3 feet tall and cover the ground below them like a blanket. While Gaillardia does not live as long as one might like it too, it is a flower that reseeds itself: if it is a biennial or perennial. If you decide to grow this flower, begin to plant the seeds indoors about 8 weeks before the warm spring weather. In order for the seeds to grow, they should be in light. Plant them in moist soil and keep them in a well-lit area that is kept at room temperature. Once you begin to see the plant growing, you can then transfer it outdoors. They are usually ready to be replanted when you see leaves. You do not have to start this plant by seed. You can also plant a pre purchased flower. Just plant it in well-drained soil when the weather gets warmer, and watch it grow. If your flower begins to grow out of control, cut it back. This will also help it to regrow at its best the next season.